The Mornington Peninsula is a popular tourist destination located approximately an hour from the Melbourne Metropolitan area. 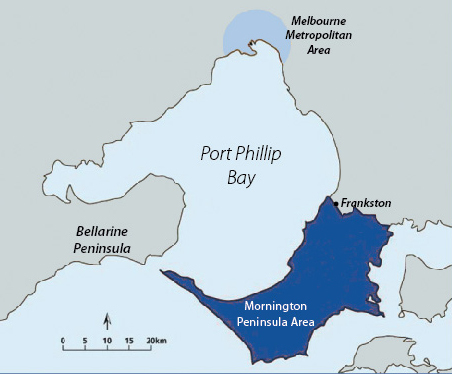 The Peninsula is home to numerous faith traditions beginning with the traditional land owners the Bunurong (Boonwurrung) people, members of the Kulin nation, who have lived in the region thousands of years before European settlement and have a unique relationship with the land and water. Predominantly Christian, the Peninsula is comprised of various denominations including Anglican, Catholic, Uniting, Presbyterian & Reformed, Baptist, Orthodox, Pentecostal and Lutheran. Other religious and spiritual communities include Bahai, Brahma Kumaris, Buddhist, Hindu, Indigenous, Jewish, Muslim, Sathya Sai, Shiva Yoga and the Theosophical Society. The Mornington Peninsula Interfaith Network is committed to promoting understanding, respect and tolerance amongst religious and spiritual communities in the Mornington Peninsula area and working towards reconciliation with the traditional land owners.